We have already met Mrs Pixey and how she likes to annoy her children. However, Mrs Pixey is also a teacher and likes to play similar tricks with her students. She believes it keeps them alert to the less playful dangers that they will likely face when they grow up. It also stops them from falling asleep. Today, she decides to play a game with four of her students: Alex, Brenda, Chris and Debbie. 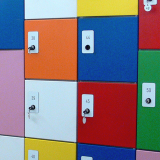 Each student has a locker with their name on it. Mrs Pixey places their homework books in the lockers in such a way so that every book is in the wrong locker. She then asks the four students to discuss which locker each of them should open. Once they have all agreed on their choices they each open their selected locker and see whose homework book they find. If a student finds his or her own homework book they get 1 point; if they do not find their own book, Mrs Pixey gets 1 point. At the end of the week, if the sum of the points won by the students is greater than the points won by Mrs Pixey, they each get a small prize. How many different arrangements are possible such that each of the four homework books is in the wrong locker? What is the probability that all four students find their own homework book? What is the average number of points that the students can expect to get in each game? Is Mrs Pixey being fair to the students?